• The African Aviation Tribune •: ►► EQUATORIAL GUINEA: CEIBA Intercontinental waves Adios to its 777. 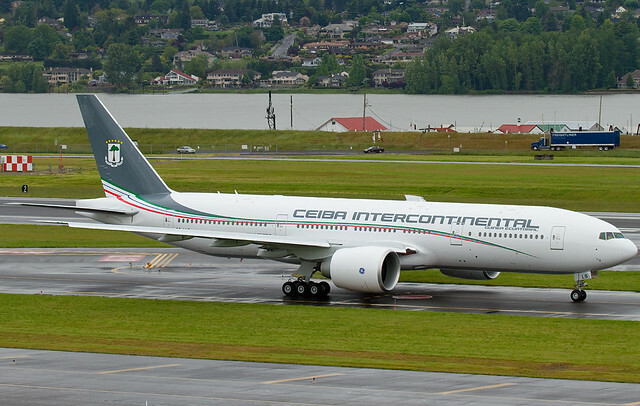 ►► EQUATORIAL GUINEA: CEIBA Intercontinental waves Adios to its 777. The Boeing 777-200LR (3C-LLS) of Equatorial Guinean carrier CEIBA Intercontinental (C2) (with what had to be one of the coolest liveries ever on a Boeing 777) today left Malabo, Equatorial Guinea for Lisbon, Portugal to be re-registered under White Airways (WI), a Portuguese leisure and charter flight operator out of Lisbon, becoming CS-TQX on the Portuguese registry. It is unclear, however, what purpose the 777 served whilst under the CEIBA name, as the Equato-guinean flag-carrier is on the European Union's Banned Operator's List. In all honesty, it wouldn't be a massive surprise if it turned out that the aircraft had originally been bought for exclusive Presidential/VIP usage given Equatorial-Guinean President Teodoro Obiang's family's penchant for the high life and luxury which of late, has come under increasing scrutiny from the international media. With the departure of the 777, CEIBA is now left with a fleet of two ATR 72-500s, one ATR 42 - 500, one ATR 42-320 and three Boeing 737-800 on order whilst its network consists of Malabo (Equatorial Guinea), Bata (Equatorial Guinea), Cotonou, Douala, Accra, Abidjan, Lomé, Libreville, Pointe Noire and Brazzaville. [UPDATE]: SkyLinerAviation informs us that the 777 has now been re-registered as CS-TQX and is to be ferried back to Malabo, Equatorial Guinea as of 21 August 2012. Hopefully the plane will now return to operation for CEIBA and we'll see it in possible international service in the near future. Watch this space for further details! ► SEYCHELLES: Blue Panorama to axe Mahé flights?